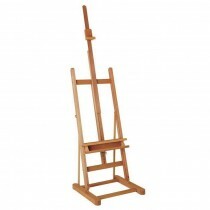 A range of large artists studio easel designed for use with different painting and drawing mediums. Studio easels give more stability and are able to hold large canvases. With numerous different designs you can find the ideal easel your oil painting, acrylic painting, watercolour painting or drawing and sketching. Studio Easels are normally situated in artists workrooms for working on final pieces.